The stable state is built on the healthy life of population, which is based on sports. Not for nothing, the major powers of the world pay much attention to the development of sport, as everywhere (schools, universities, and organizations), so on the international level (participation in the Olympic Games, various tournaments and championships). Kazakhstan also works on the development of sport in the country and increase of the part of the population engaged in this or that kind of sport. The number of sports complexes and various sections in Astana is growing steadily, and building of arena for international competitions is also under way. Today in the capital of Kazakhstan there are sections and gyms in 55 kinds of sports, most of which are included in the list of Olympic disciplines. And love for the sport is fostered here from the childhood: frequently in the sections children of 5-6 years begin to train. In addition, the city highlights some sports. First of all, it concerns the most popular sport of the world - football. Its spread is so great that football is played in almost every school, college and university. Also, there are many clubs and large stadiums in the country. In Astana, the most distinguished stadium is the stadium Astana Arena. It seats 30,000 spectators and has a movable roof. So, the level of this complex allows holding large matches. Not less popular sport in Astana is hockey. Medeo, becoming the property of the Kazakh people, promotes the development of winter sports throughout Kazakhstan. 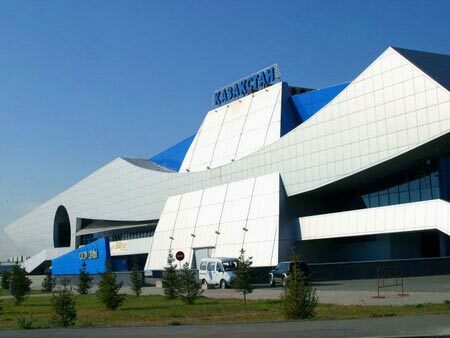 The confirmation is the hockey club of Astana – “Barys”, which is located in the Ice Palace "Kazakhstan". Players of Junior hockey team in this Sport Palace are the age of 7-8 years old. In addition, many gyms for artistic and rhythmic gymnastics work in Astana. Thanks to the centuries-old traditions of the once nomadic people, equestrian sport in Astana is not just the sport, but also the connection with the past of this people. Do not forget about the martial arts - boxing, taekwondo, jiu-jitsu, aikido, y-shu, and many other martial arts attract many students. Say what you like, but in Kazakhstan really much attention is paid to physical culture and sport, as evidenced by the many prizes in competitions and tournaments of different levels.